Running more than one experiment at a time. Doing simultaneous calibrations and sample measurements. Performing thermal analysis at faster temperature ramp rates. 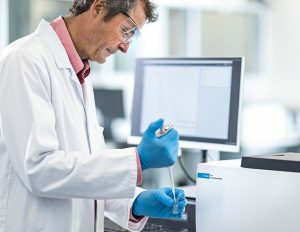 The new Agilent Cary 3500 UV-Vis makes it all possible. Designed from the ground up, this innovative system will streamline your experimental design and amplify confidence in your results. The Cary 3500 Multizone UV-Vis has no moving parts and allows up to temperature zones to be configured. What’s more, each pair of cuvettes can be held at a different temperature – so you can do four experiments at once. Ramp at up 30 ⁰C/min and improve accuracy and reproducibility. Measure your standards and sample concentrations at the same time, and under the same conditions-amplifying confidence in your results.